Water and energy are the most important resources globally. The term ‘water-energy nexus’ was coined to underline their close connection, and the phrase has become increasingly popular with international environmental organisations. 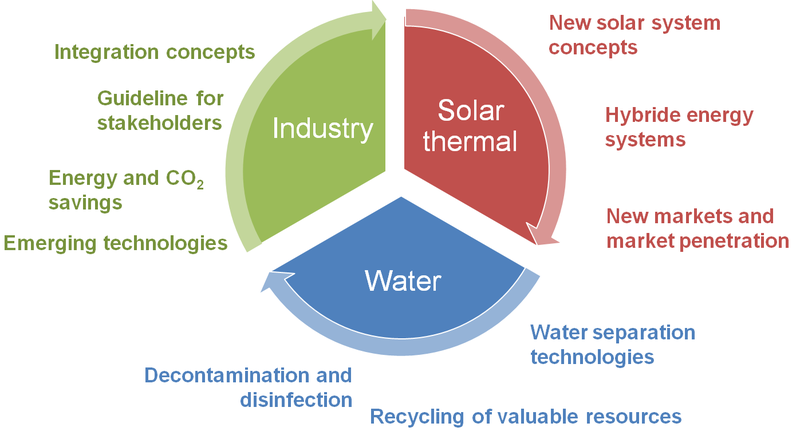 In mid-June, a new research platform, Solar energy in industrial water and waste water management, was launched by the IEA Solar Heating and Cooling Programme to analyse the link between water and energy across the industrial sector. The kick-off meeting is scheduled to take place between 1 and 2 October in Graz, Austria. Open up new opportunities for solar thermal. Equip water purification plants with new technologies. Recover metals, carbon, phosphorus and other valuable materials from industrial waste water. One focus of the platform is to evaluate the benefits of solar technologies. “We want to develop a matrix showing industrial customers’ needs for separation processes and assess cutting-edge solar thermal technologies, including their pros and cons,” Brunner said. The group is headed by Joachim Koschikowski, a researcher at Fraunhofer ISE. A second one chaired by Isabel Oller from CIEMAT-PSA is said to be working on technologies that use sunlight or UV radiation to decontaminate or disinfect water. Brunner has extended an invitation to collector manufacturers to participate in the analysis of new applications, with the opportunity of creating tailor-made solutions (see the contact details at the bottom). Another aim of the platform is to offer guidelines to planners and engineering firms to support their decision-making processes. “It is important to understand industrial end users. It is why we will study the implementation of the water-energy nexus in industry,” Brunner said. Mikel Duke from Victoria University in Melbourne, Australia, has been chosen to head this market-orientated research group. The kick-off meeting is scheduled for 1 and 2 October in Graz, which would put it just ahead of the International Sustainable Energy Conference, also taking place in the city. Meetings will then be held twice a year for two days each until the project ends in September 2022. Researchers and businesses interested in participating can contact Christoph Brunner via the email address below. There are ten research platforms under the auspices of the IEA. So-called tasks manage collaborative research efforts in a wide range of fields, from solar envelope solutions to storage tank design to the integration of large-scale solar fields into district heating and cooling networks. The new task Solar energy in industrial water and waste water management has already been the 62nd since IEA SHC was established in 1977.